One of the harsh realities of job search explained. This is a guest post by Recruiting Animal. Have you ever felt that a recruiter lied to you? I was going to write about hiring managers being the dumbest people in the world but I decided to write about recruiters instead because, you know, they're dumb, too. I'll often see a recruiter puffing up her chest online and strutting around bragging about how transparent she is with candidates. Of course, the answer is always “No.” but you have to force them to admit it. They'll say, “He thought you were very intelligent but it just wasn't a match,” and try to claim that this is transparent. What they usually mean when they say “transparent” is that you send an automated email to someone who applies to a job online telling them that their resume has been received. Then you send them another email when they have been rejected. But the recruiter wants to prove to everyone what a good person she is so she tries to argue that this is transparency. No recruiter gives substantial feedback. We can't. If you're missing specific skills and someone else has them we can tell you that because it is a matter of fact. But we can't tell you that the hiring manager doesn't like you because you look a bit frumpy or because you're a drip. And people get rejected for that. I once sent an HR Generalist to an interview and she was rejected because she didn't fit her clothes very well and her hair didn't look nice so the company didn't want her representing them. I didn't tell her that. My client didn't give me permission — and I didn't ask for it either. So, remember this job hunters: recruiters aren't social workers. It's not their job to tell you how to improve. If they can, they will; but usually they can't. The Recruiting Animal is a headhunter not a rock star. He's not even a rockstar headhunter. (That's @Jerry_Albright). He runs a rowdy online call-in show about recruiting and careers. His website is: RecruitingAnimal.com. Professional Recruiters: Job Seeker Friend or Foe? Help! Recruiter Lied. Now I’m Stuck in a Job I Hate! Subscribe to JobMob via RSS or email and follow me on Twitter for more recruiter insight for job seekers. Job seekers should be grateful to Animal for telling it like it is. It’s only when you can stand in someone else’s shoes that you can understand where their coming from. It should come as no surprise that people do what makes their lives easiest. Of course, it’s also a way that some get away with agism, sexism, racism and lookism. No recruiter is going to tell a candidate the employer wants only a certain age, body size, race or gender because they know they’ll get sued! Recruiters don’t lie to me about why I’m rejected. They lie to me by telling me the employer is very interested in me and will be setting up an interview early next week. Then they either say that it’s been delayed or just stop answering my email altogether. I think what we as recruiters do is, position an individual/candidate with as much information as we have, without being hurtful or jeopardizing our trust/relationship with our customer. One recruiter forgot her appointment and stood me up. Then I called her Assistant (who set up the appointment) half hour later to inquire why I did not get a call as scheduled. The Recruiter called back to leave a message that she forgot and asked me to return her call immediately. She apologized. When I called her back immediately, the Recruiter did not pickup the call. Called about 4 – 5 times with 10 minutes interval. No answer! I knew right away, either she was embarrassed, or try to cover-up her incompetence. I sent an email to the Recruiter stating when I can reach her at her convenience. No reply received even after a few day later. It was obvious. The gatekeeper has abused her authority, incompetent and tried very hard to cover-up. In fact, the company was defrauded when the Recruiter cannot competently perform her job and cover-up each time she failed. I am a Certified Fraud Examiner, I know b/cos it’s by job to detect fraud, waste and abuse! Nice diplomatic article. Let me add that recruiting is a sensitive “sales” process. Selling talent and beauty is hard and this makes the recriters close down when it comes to talent and personal feedback. But a talent recruiters for models and actors are just as secretive. Saying they lie seems like a good way to catch readers attention. Good writing! Most of the candidate replies listed here, show why it it so much easier to not engage the candidate after a failed interview. You just end up spending hours patting their egos as to why they didn’t get hired. The candidate is the problem, not the recruiter. When I was a commissioned recruiter, I screened every resume that had the profile I was seeking. Current recruiters are lazy, They do mass mail screening, They do not know how to qualify or prioritize their clients requirements. For the most part, they do not understand the technical terms or understand their variations. i.e. procurement, acquisition, purchasing, They assume that system engineer are all informational oriented. There are some of us that are production system oriented. Programming vs. application of software is another issue. My pet peeve are those that believe that the product / process / industry don’t matter as a person advanced in the engineering field. Processing natural gas is far different from manufacturing tractors. Welding iron is different than welding titanium, aluminum or brazing copper. Keep in mind, when they meet monthly at the HR area meetings potential interviewers are discussed. Another issue to keep in mind. A department manager does not want anyone with an education more extensive than their own, thus you are overqualified. Recruiters lie all the time. 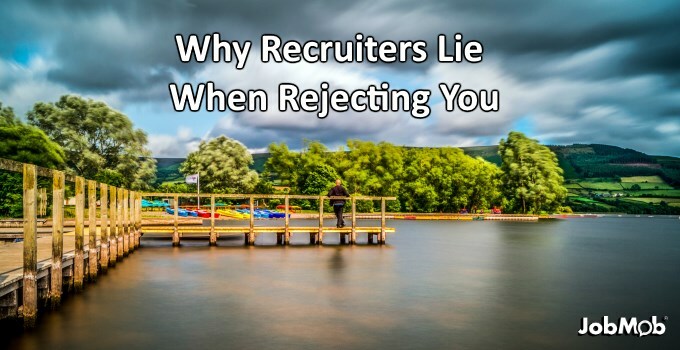 They say, “I’ll get back to you (fill in the time frame) no matter what,” in order to pretend they are better than all the other recruiters who never get back to candidates. But then he or she doesn’t get back to the candidate either. I have more respect for the recruiters who don’t make promises and just never contact you again. Two reasons, perhaps more common are these. 1. The hiring company is concerned about being sued. 2. The recruiter or hiring manager does not want to be yelled at, wept at, or in any way made to feel uncomfortable with the company’s decision.